Some of you know, but many do not, that I am a published author of somewhere around 12 or 13 books (I’ve lost count). I have an idea for a book that instead of going the usual route in working with one of my publishers, I’m actually thinking of doing as an E-book. It would be a book of prayers similar to what you’re reading here at the end of each post. Would any of you be interested in such a thing? A dear friend of mine is an incredible writer of Christian fiction and he has developed a plan whereby you widen your readership through self-publishing E-books and I find it a very interesting concept. Please leave comments with what you think pro or con. I’ll be looking for them. If it went well, I might then pull together some of the other writing I have done on this blog for building relationships etc. and create other books that have different themes. The Lord is stirring up the sense in my heart that I need to get writing again after about a 4 year intentional break from publishing… it will be interesting to see where He leads! We took 5 rolls of film when we visited our grandbaby, Ellington. My daughter forgot to pick up the film this afternoon, so she’ll pick it up for me tomorrow. Then I’ll be able to post pics of the family-tug-of-war we held over him. Since he was not only the first grandchild all around, but also the first nephew to each of our children, we fought over him incessantly! It’s such an emotional journey becoming a grandmother. You don’t have control. You struggle with that concept then you discover that’s actually the fun of it! You let go, and let someone else enjoy learning to be a mother/father. Your job is to just enjoy the baby. Watching your child parent, you have flashbacks to your first days as a mother — and you try to remember that there ever was a time you weren’t known as "Mom!" You hold a tiny bundle in your arms, knowing more than you ever have before, how fleeting that moment is and how soon you will look up to the little boy that now fits into your arms and nestles under your chin. Remembering back to my first days as a mother, I recalled the wonder and adventure it was to learn everything about the new little child that was mine to care for. I was sometimes overwhelmed and afraid and the rest of the time felt like I had been her mother forever and knew exactly what to do! It was a time of great growth and incredible sleep-deprivation. It was fun to watch Ariane go through all of the same emotions and experiences and becoming so proficient at being Ellington’s mother. Being in touch with my memories made me think of something I would like to share with you, just in case some of you are struggling in difficult financial (or other) times right now. When I was first pregnant with my daughter Jennifer, her dad, my late husband Jim, lost his job with Sears. It was during the 1980-81 recession and unemployment was over 10%. It’s easy for us now to have a heart attack when the rate is just over 5%, but that rate is lower than almost every other time in our country’s history. For perspective, we’d have given anything to see that rate when Jim was unemployed because when unemployment reaches 10% you can’t even find a job at McDonalds! At each stage of my pregnacy I had so many things to worry about. How would we pay for my prenatal care and birthing costs since it was now a pre-existing condition? I worried and worried. I thought about it night and day. I would turn it over to the Lord, then take it back. After a long battle I was finally, half-heartedly able to pray "with thanksgiving." That meant my prayers went from panicked cries for help to ones like this, "Thank you Lord that though I can’t figure out how you are going to take care of this, I trust that you will. Thank you for providing the money for us to have this baby." One day, three months into the pregnancy I received a very plain little post card that was one of the most beautiful things I have ever seen before or since! It asked us if we would like to continue paying for our Kaiser Health Insurance at the cost of $35 a month for the family. You have no idea how fast that postcard was back in the mail with a check attached! I had battled to trust the Lord and he provided a way where there didn’t appear to be a path forward. I had no idea how he could provide, but he did. Each month we were able to make the insurance premium and in the end it cost me only $2 to check her out of the hospital — which was to pay for the phone service! There were many other financial stresses during that time. We lacked groceries at times and just when the cupboard was bare four bags of groceries would be left on the front porch after someone rang the bell and ran. At one point we got three months behind in our house payments and came very close to our home going into foreclosure. Because of pride, my husband had not told his parents that he had lost his job. The crisis with our mortgage finally brought him to the place of opening up to them. He was afraid of their reaction, but of course they came to our rescue in amazing ways. They had the resources to save our home, provided for our needs and even more importantly helped their son get moving towards finding a new job. I’m in tears as I recall the incredible loving support of my in-laws. They are amazing people who have blessed my life in so many ways. Still, night after night I had fearful dreams, racing thoughts and battled fears of what would happen in the near future. But I began to learn that the worry never changed anything. What changed our circumstances was being transparent with family and friends (and the Lord in prayer). When we were able to confess our need, they were able to step up and meet it, AND BE BLESSED BY DOING SO. Help came from every side. All we had to do was let go of our pride and ask for help. Help came in many forms, some inexplicable and heaven-sent, but most often God met our needs through the loving hands and hearts of those who shared our lives. If you’re struggling with anything today that is just too big for you to handle, too painful to cope with, or too fearful to contemplate, please stop and pray this prayer with me. God is able, but more importantly, God is willing to handle every burden you entrust to Him. PRAYER: Lord, I’m struggling with some of the most overwhelming things I’ve ever had to deal with in my lifetime. I don’t know where the answer is going to come from. My mind cycles over and over, worrying about it, being anxious and fretting. Help me to learn how to "be anxious for nothing but in everything, by prayer and petition, with thanksgiving" to present my requests to you. Well… I managed to get this completed and almost ready to upload so I’ll give you a sneak peek at next week’s kit. This is a second kit in the Paper Flowers Series and like the first kit is has two pages of flower parts that you can cut and layer to create additional flowers to the ones that are already put together within the kit. 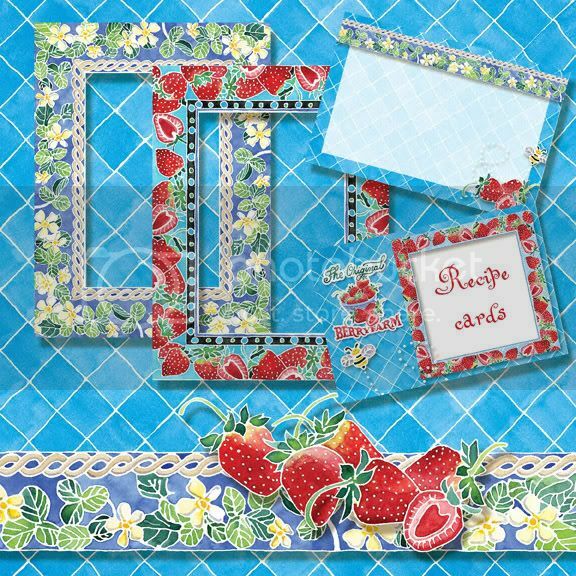 There are quite a few papers and frames included that work well not only of course for scrapbooking, but also for creating greeting cards and other craft items. 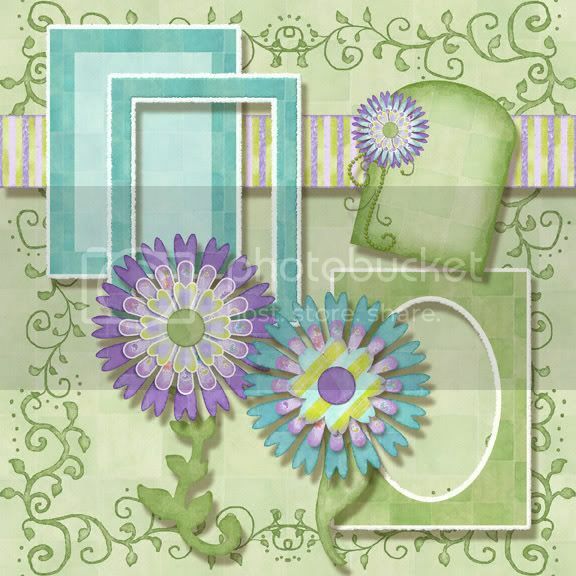 You can easily use the flowers in layers digitally or cut them out and add dimension to your crafts and gifts. As I played around creating the background papers out of the flowers, they began to take on an almost "quilted" feel to them. In a lot of ways the paper flowers are created very similarly to a quilting applique technique but with paper. I think that the possibilities with them are pretty close to endless! There are still more previews, but I’ll save them for another day. It’s time to turn my attention towards packing for our trip. Have a great weekend! for fear something will happen AGAIN and I won’t get to see my grandson, but we’re going to San Diego tomorrow!!!!! Yippee!!!! No one has the sniffles, the car(s) are running, the puppy has a place to stay for the weekend… what else haven’t I thought of?! We’re so excited to finally get our hands on our little bundle of joy. Well… I’m assured he’s already over 11 pounds so I’m not sure how little his bundle is. It’s hard to believe he’s already 5 weeks old. So, I won’t be writing much over the weekend, but I will be enjoying myself immensely and taking lots of pictures. I got my cruise pictures back but haven’t had time to sort through and post some. I’ll probably do both when I get back. I’m trying to rush out a couple of kits for the next week or so. 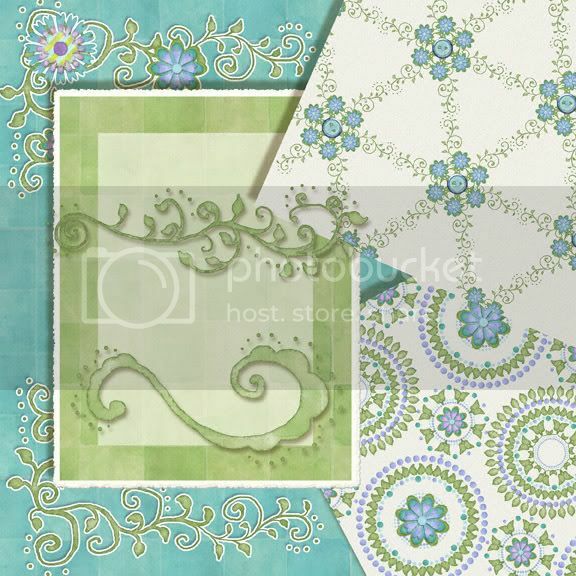 I ‘ve been working on two new add-ons for "Paper Flowers Collection." Ideally they’ll be waiting for Lynnie to upload before I leave, if not as soon as I get home Tuesday they’ll be in the works. Okay Lambie, I Give in! 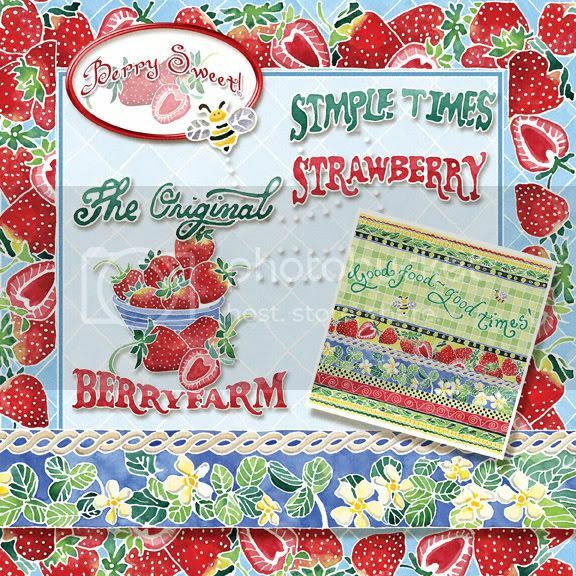 If you happened to read any of Lambie’s 30 some comments during the short run of the contest, you might have noticed a theme "How about a strawberry bookmark freebie?!!!!" I had promised a freebie this week, so in honor of my 200,000 visitor, here’s a book mark for your enjoyment. There are two versions, one blank for your own message and one with a friendship message already included. To download your gift, simply click on the image and a 4shared.com window will pop up. I’m working on finishing up the kit for the store, I’ll let you know when it will be ready, in the meantime you’ll be able to enjoy a little "taste!" Cheryl Angeland! Who snuck in at the last possible second to nail it! However, I’m going to send the font to all three people that jumped on board this crazy last minute contest 🙂 So look for an email! So I thought it would be fun to give away a prize to the person who posts a comment closest to the 200,000 mark. I’m going to watch the board and look at the comments coming in and the winner will get a brand new font (personal use version) that I’m working on today. I’ve spent the last couple of days creating several new and interesting fonts. 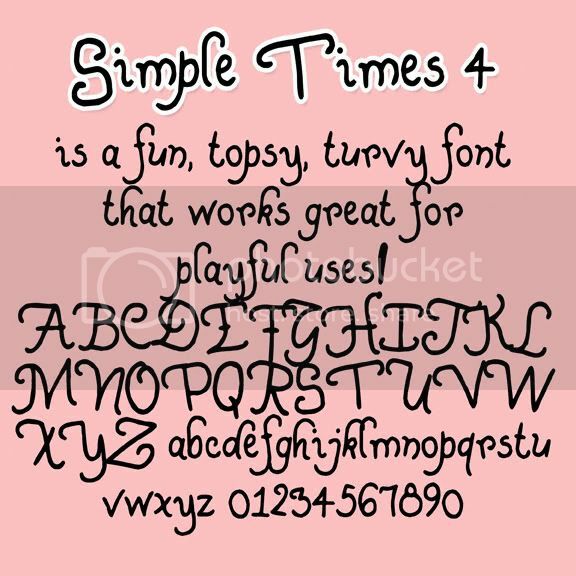 The one I’ll give away is called "AJR Simple Times 4" It’s a fun, topsy-turvy hand lettered font that would be great for a lot of uses. I’ll post a pic in a few minutes but wanted to get this notice up for the last second contest! There’s no limit to the # of comments you can make so go for it! From yesterday’s post, the winner is the one who posted the 10th comment! 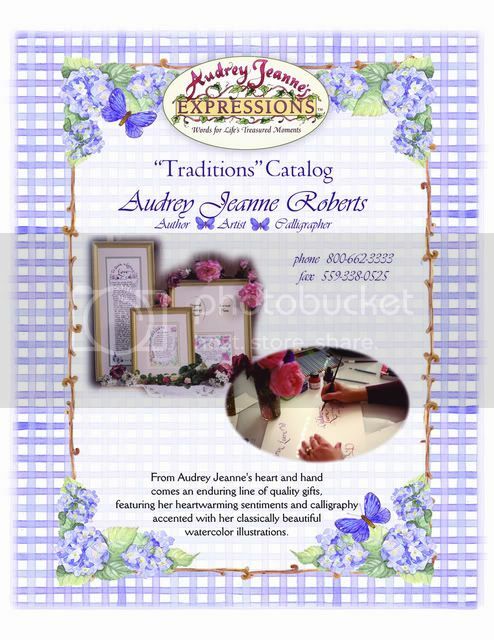 She wins the New Antique Lace Greeting Card kit that came out this week at Daisie Company for $3.98. If you’d like to see more of the kit you can click on the image to the left and it will take you directly to the store. Congratulations to the winner!!!! And for those that didn’t win, please keep posting those comments we do it twice a month. I finished the product shots (previews) today and wanted to post a couple more for you. This kit is so bright and cheerful. The real fun was eating the first fresh strawberries of the season while working on the kit and having snow flurries and sleet falling outside my studio window. Boy was that a strange juxtaposition of seasons! There are several round frame sets with this kit that can be used to create paper liners for cakes or pies to rest on. We used this set for my daughter’s $125 auction winning New York Strawberry Cheesecake a couple of years ago and it made for such a lovely presentation. 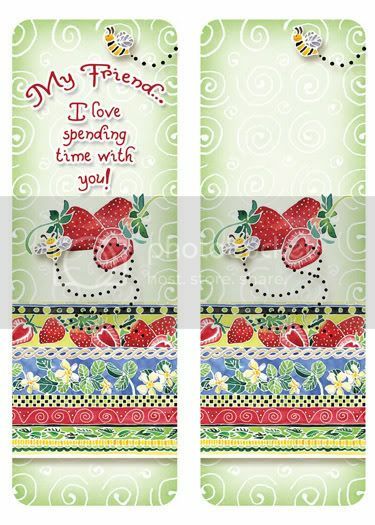 A very fun picnic set, scrapbook page or party decor could be created with the art from this kit. This particular style of art is inspired by "batik" silk painting and is very detailed and time-consuming to create but has an ability to achieve a brighter, more powerful color saturation than most watercolor can accomplish. 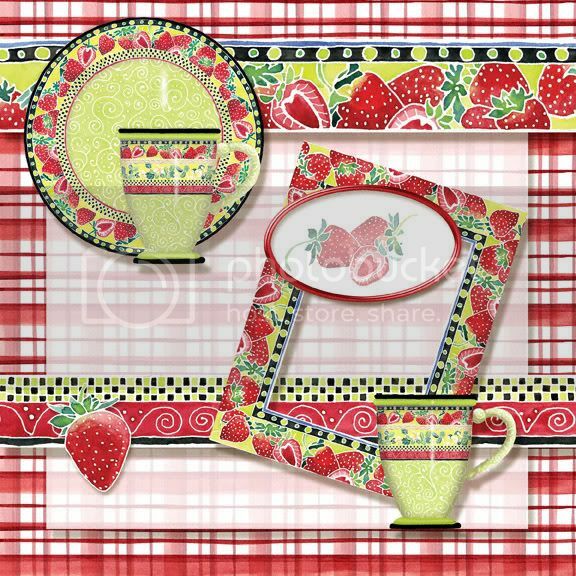 I have several other food themed sets with this art style that will be coming in the next few months. I’ll have two more previews of this set coming probably tomorrow or Monday. I hope you are enjoying it and I sure wish I could pass you the strawberries and cream! As I literally came dancing into my doctor’s office this morning ready to tear the eye patch off myself, my Doctor was dancing along with me! He’s so much fun and a great doctor. My first eye test on the right eye was almost 20/20 which is even better than the left eye was for a couple of weeks. I actually had to take off my glasses today except when I was wearing my sunglasses (clip ons) We’ll have to see how things work when I’m painting etc. I have a lovely bloody looking eye, but it doesn’t hurt and is no big deal. Thank you to each for the wonderful messages of encouragment and praising God with me. I have about a million things I want to paint and spent the day luxuriating at Barnes and Noble studying tons of magazines for trends, color palettes and ideas for my next batch of art. Now if I could just touch a magic wand to my head and have it jump onto the paper!!!! I didn’t get to do any work today on finishing the previews for the rest of the strawberry kit so stay tuned over the weekend. I’ll get them up soon. I have loved the words to Amazing Grace my whole life and will instantly tear up if I hear a beautiful rendition of it sung, but now it holds an extra special place in my heart for entirely different reasons. For the past aproximately 15 years I have had a battle that I haven’t spoken openly about except to a few precious friends and family members. I have wrestled with my vision getting ever weaker for reasons I didn’t quite understand or know. About 13 years ago, my optometrist told me that my eyes were getting worse at a much faster pace than he would expect of a woman of my age (at the time 36) but he didn’t look any deeper for the cause. In fact, my eyes went from rather far-sighted to near sighted within the space of 6 years. About 4 years ago I began to notice difficulty with head lights when driving and seeing double images of lights (like the moon) and other items that would seem to overlap each other. About 2 years ago I saw such a difference that I began to search out answers and looked for an optometrist that could help me understand what was happening. After a thorough exam that included detailed photographs of my eyes, my doctor told me that I had cataracts. He told me that I needed to wait until I couldn’t stand it any more and then he would refer me for surgery. Well… the first surgery happened a month ago on my worst eye and it was nothing short of miraculous. My second surgery happened yesterday, on Friday morning (March 14th) I will have my bandage removed and will see clearly for the first time in decades. I’m so blessed and amazed at how wonderfully I can see with one good eye, I can’t wait for the final unveiling. It’s a whole new world. I won’t even tell you how ridiculous it was in the last six months to try to draw or paint, but God gave me the grace and ability to do so. I should have had my husband take photos of my set up with my glasses and giant magnifying lenses over the top of them! So, as you can imagine, this past two week’s painting has been such a relief, joy and delight. I’ve painted more in two weeks than the total of the six months prior work . I’m sharing this with you because so many of you have become dear friends through this blog, and I try to share as much as I can about my real life, including both my struggles and my victories. I also want to help educate you in case you are suffering with cataracts and don’t know it. Cataracts can come from several sources: Diabetes Melitis, extended steroid use such as Prednisone, genetic errors of metabolism and chronic exposure to UV rays usually through exposure to sunlight. I am likely the later and possibly even the genetic aspect as I think it quite possible that I’ve struggled with this the better part of my life. I’ve constantly complained that my vision was blurry even though my eyes were "great." If you get a new prescription but still don’t seem to see clearly, you could be experiencing the onset of cataracts. I grew up in San Diego, body surfed and spent a lot of time at the beach, pool and playing tennis competitively — all without wearing sunglasses as I just didn’t really like them. I learned my lesson and I hope you and your children will as well. Symptoms of developing cataracts include double or blurred vision, sensitivity to light and glare (which may make driving difficult), (AJ’s note: difficulties with night driving were one of the first major complications for me) less vivid perception of color and frequent changes in eyeglass prescriptions. Cataracts are typically detected through a medical eye examination. The usual test for visual acuity (the letter eye chart) may not reflect the true nature of visual loss. Other tests that measure glare sensitivity, contrast sensitivity, night vision, color vision, and side or central vision help to nail down the diagnosis. Because most cataracts associated with aging develop slowly, many patients may not notice their visual loss until it has become severe. Some cataracts remain small and never need treatment; others grow more quickly and progressively larger. Only when a cataract seriously interferes with normal activities is it time to consider surgery. People who depend on their eyes for work, play and other activities may want their cataracts removed earlier than those whose needs are less demanding. (Quoted from http://www.healthscout.com/ency/68/114/main.html#SymptomsofCataracts ) "
You can find out much more simply by googling cataracts. If you think that this might be an issue for you, I heartily recommend that you pursue seeing a doctor and having the surgery if recommended. It was virtually painless, the only pain was the stick of the needle for the IV. The results were instant and amazing. Don’t let fear hold you back. A friend of mine, Deb D here on my blog and the Daisie message board, told me that "The hardest thing will be the wait between your first and second eye!" and she was totally right. I was especially glad that I had had the first surgery before going to the Bahamas two weeks ago. The colors were amazing and the ability to drink it all in was something I’ll treasure forever. I am like the blind man who was healed and turned back to thank Jesus. A Really Fun New Kit Coming Soon! I have a quick preview to show you today. I hope to have some more images from the kit perhaps tomorrow and I’ll also do a FREE recipe card perhaps next week so stay tuned! This kit would be fun to use for all kinds of kitchen crafts, recipe crafts and lots of other fun things. It will be available next week at Daisie for $5.98 for the digital downloadable kit. I’ll have a much longer post tomorrow and be sharing some really wonderful, exciting personal news, so make sure you drop by again tomorrow! I know that there are those among my readers who simply will not relate to this post at all (your house is in order, you love neatness and orderliness and can’t imagine EVER letting things go so long that you’re going to feel this overwhelmed!) You have permission to stop reading and go play in your craft room. This post is for the rest of us that would categorize ourselves somewhere between "slightly messy" and "total slob." Most of the time I would classify myself just to the right of "slightly messy" but right now? There’s only one problem with taking a vacation when you work for yourself, the elves quit working when you’re gone and absolutely everything piles up waiting for your return! As I am looking at my disastrous studio, a bedroom still filled with luggage to empty and stow and a house that might have gotten a little bit away from us BEFORE we left and hasn’t gotten any better since our return, I thought I would share some of the things I’ve learned about how to proceed to wrestle life back into order when all is in chaos and disarray. When life gets a little out of control most of us "messies" have coping mechanisms that enable us to wrestle it back in line, but when it’s REALLY out of control it’s so easy to just want to sit down and throw a pity party! When no matter how hard you work TODAY it won’t look much different it’s hard to get motivated to get moving. But the Lord has taught me a couple of things that have been so helpful over the years because this is a battle I face often. Don’t look at the big picture or you’ll just quit before you start! Look at the overall picture just enough to decide what is the MOST IMPORTANT thing you must attend to and do it. If you have no clothes to wear it’s probably to attack the mountain of laundry! Is there a stack of bills on the kitchen counter? If you want electricity to operate your computer you’d better handle it. Once the most imporant, life-impacting things are attended to, look for the tasks that you can do the most easily and quickly. Why? Because when you can see improvement you start to feel better and build momentum to finish the rest of the tasks. During the winter we often end up with 4 quilts strewn around the living room. It’s amazing how much better the room looks when those simple items are folded and put away. Get your room/house into okay shape before you attempt the super-detailed cleaning projects like washing windows or dusting the china cabinet. Don’t get bogged down in extreme cleaning a single area. Make it a game. I’m really good at playing head games with myself! I set a timer and race to see what I can get accomplished in 15 minutes. It’s really amazing how much difference you can make this way. I also will mix rewards in so if I’m reading a really great book I’ll tell myself that I can read a chapter if…. After a while, I don’t even want to read the book anymore because I get on a roll. An empty trash can is an invitation to quick cleaning! I love to bring in a giant trash can and start filliing it with the left over papers, magazines or stuff that builds up in my studio. It really motivates me to deal with things realistically. If I am not likely to ever need it again and it has no value to the Goodwill, it’s gone! Set a reasonable amount of time a day you can devote to the project and do it. Then stop when that time is done. If it’s 1/2 an hour a day in a week you might see huge results, but if you do an explosive evening’s work that tires you out for the week, you’ll just end up being in a worse place. It’s really amazing what small consistent bursts of energy can accomplish and it’s one of the worst areas for those of us who are creative to master. Know that no matter how good you clean and organize, realisticaly it’s going to fall apart again. Just work at stretching the times between the falling apart and how badly you allow it to fall apart and you might just discover that you actually like keeping on top of it more than you thought you would! Unfortunately,I’m not going to be able to implement my strategy to take control over my house today as I still have work projects to deal with, but I’m getting myself psyched up to do it and might tackle an hour or two later today! Good luck to those of you that will be able to do so. PRAYER: Lord, over and over I have "vowed" to make changes in my life and yet find myself right back in the same place, battling the same sense of being overwhelmed again and again. It doesn’t surprise you, and I know you don’t want me to run away and hide. I know you want me to come to you again and again if I must, to gather the strength and wisdom to make changes in my life. Has been turned into an Adobe Reader PDF document that you can now download. This is our older version catalog. We are working on the new catalog for this year and as soon as the new designs have been completed it will also be released. You can access this page any time by looking at the "Pages" column to the right. You can download the catalog by clicking on the image to the left. It will lead you through the downloading process. The download link is at the bottom right side of the page, in a white box. It might take a minute for that box to appear, but when it does the link will be active. Please be aware that it is a relatively large file that will take a while to download. When you go to the download site, it will be green in color and look very generic, it is my 4shared.com site, so don’t be worried that it doesn’t look like my blog. It is at 100 dpi, which is slightly better quality than monitors can read and will allow you to enlarge to see detail and read text. This catalog and all the artwork and poetry within it are officially registered with the United States Copyright office and we intend to fully enforce those copyrights. Please respect them or you could be held liable for both punitive damages and legal costs. We ship anywhere in the US and Canada, shipping rates vary with weight and distance. We can ship elsewhere in the world but cost usually proves prohibitive. The Blog Contest Winner is…. Commentor #12 on this post: http://www.daisiecompany.com/blogs/audreyjeanne/?p=333 Congratulations to the winner! If she doesn’t already have the set she was commenting on I’ll send it to her as her prize, if she does I’ll pick another one. I’ll be getting back to work on Monday, today is destined for napping, laundry and cleaning as we recover from our week’s vacation! It was a very, very restful time. We were on a business trip but had more fun than doing business usually entails. We met some very wonderful people and ate waaaay too much food and managed to sleep in most mornings and nap most afternoons. It was perfect! I’ll post some pics later this week when we get our 6 rolls of film back so stay tuned!